It’s been clear for a while that Netanyahu’s power is thoroughly bound up with his up-close and personal alliance with the US president. Trump’s list of gifts to Netanyahu goes back a long time. And that was all on top of the ongoing US support for Israel and Netanyahu, including the $3.8 billion a year in US tax dollars sent directly to the Israeli military, the unfailing protection of Israel in the United Nations ensuring that no Israeli political or military officials are ever held accountable for potential war crimes, and the efforts to criminalize nonviolent boycott campaigns aimed at ending Israel’s violations of human rights. Those go on all the time. But Trump’s embrace of Israel has escalated the already supportive relationship far beyond any of those earlier assumptions. The whole run-up to the election was a tour de force of US enabling of Netanyahu’s reelection and the rise and consolidation of Israel’s far right wing. 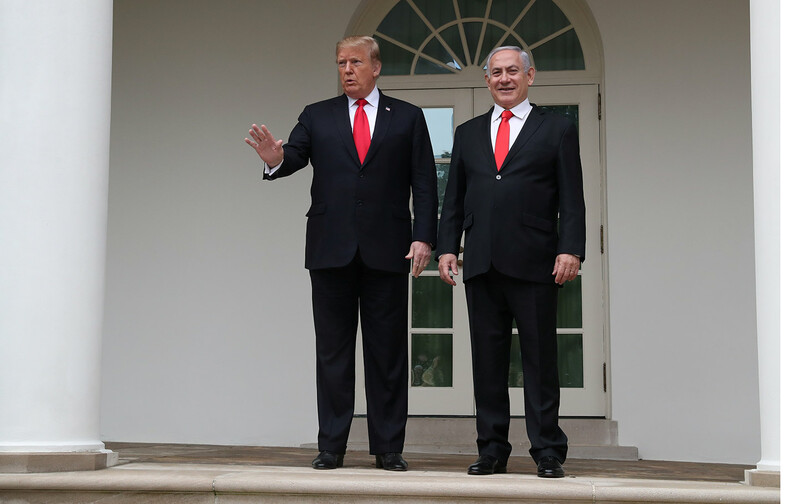 American-controlled “peace processes” have failed in Israel-Palestine for more than a quarter of a century, but Trump’s actions will prevent the US from playing any potentially benign diplomatic role in the near future. And they’ll significantly raise the threat of a US war with Iran for a long time to come.